16 December 2015. An engineering lab at Columbia University is researching a new regenerative process that better integrates human tendon and bone tissue to repair rotator cuff injuries. 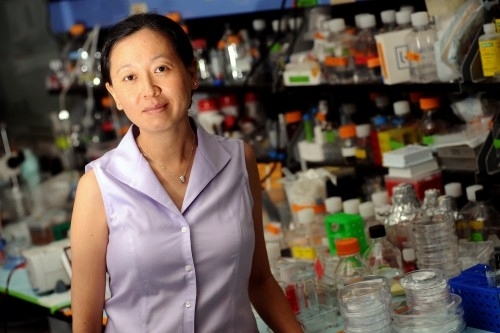 The team led by biomedical engineering professor Helen Lu is funded by $1.1 million grant from Congressionally Directed Medical Research Programs in the U.S. Department of Defense. Lu and co-investigator William Levine, a professor of orthopedic surgery at Columbia University Medical Center, are seeking better methods for repairing a torn rotator cuff, a common shoulder injury. The rotator cuff is made up of muscles and tendons that allow individuals to raise and lower the arm, and stabilize the ball-and-socket joint in the shoulder. A rotator cuff can tear as a result of traumatic injury such as a fall, or degenerate over time due to repetitive activities or aging. The university says military service members suffer rotator cuff injuries at twice the rate of the overall U.S. population. Repairing the rotator cuff usually requires surgery to restore function and flexibility to the shoulder, including attachment of the torn tendon to the humerus, the upper arm bone. In many cases however, the mechanical connection of tendon tissue does not reintegrate with the bone, and the weak attachment can tear again, a common outcome of rotator cuff surgery. Lu, Levine, and colleagues plan to apply their previous work in tissue engineering to the problem.”This is the culmination of our decade-long, interdisciplinary collaboration on integrative rotator cuff repair,” says Lu in a university statement. The researchers propose building a stronger tendon-bone link with a scaffold made from nanoscale fibers that emulate natural connective tissue. The scaffold fibers would align with tendon tissue and be seeded with stem cells that would regrow new connective tissue integrating with the bone. The goal is to provide the stability of a surgical graft patch, but with the integrity of a natural tendon-to-bone connection. The Department of Defense funding supports the Columbia team for three years, through preclinical tests of the engineered tissue. The grant comes from DoD’s Peer Reviewed Orthopaedic Research Program that funds studies of combat-related injuries to skin, bone, muscle, cartilage, and nerves.